Home Community How hard could it be to be a clown? Especially now that clowns are creepy. Are you prey to coulrophobia? Never heard of it? Hint: If you attended your first little kids’ party and you pitched a hissy fit at the sight of that figure in a purple fright wig with a red nose the size of an heirloom tomato, and slippers big enough to haul coal down the Mississippi, you’ve got coulrophobia, otherwise known as fear of clowns. Sounds pretty petrifying to me, but for the most part, these goofy bastards, these clowns, do their best to entertain. The big painted smiles around their lips and their cutesy voices are designed to make people giggle, not make kids run screaming to their mommies. And then along came Stephen King with his novel “It,” and a whole new population of coulrophobes was born. In “It,” a clusterfest of bad stuff takes place in a small town called Derry along the coast of Maine, but the main baddie is a clown in a silver suit who hails by the name of Pennywise, which, when you come to think about it, sounds like a dude with a good pension plan backed by solid IRAs. In actuality, he’s a shape-shifting D-E-M-O-N who returns to Derry every 27 years, spending 12 or so months marauding and devouring children. (Stephen! Couldn’t he have just tickled them until they passed out?). Someone should stop this man, this Stephen King! Hadn’t he promised to retire? And now in the fall of 2016, a rash of killer clowns has overtaken the news cycle. “Fear of Clowns Is Sweeping the World” screamed a headline in Heat Street. The creepy-clown craze began with reports of clowns luring kids into the woods in South Carolina. Even as far away as Australia, the town of Perth put into effect a 24-hour clown watch, noting sightings of clowns with chainsaws. Yikes! As if mallet-size noses weren’t scary enough! But, for real, the news has been chock-a-block with evil clown stories. Don’t we have enough to be freaked out about?! Retailers have been sensitive to the issue. In the run-up to Halloween, Target pulled its clown masks, and over in the burger biz, Ronald McDonald has been keeping a low profile. Last I heard, he was in Saint-Tropez flirting with the Duchess of Cornwall. So imagine my surprise recently to see one of my favorite Island peeps — Montreal-bred figure skater, singer, dancer, and harlequin Corinne de Langavant — crossing Beach Road in front of the Sea View condos, clad in a frilly yellow dress, flappy red shoes, a wig of frizzy orange curls, and a big red honker in the center of her face. “You’re still doing clown gigs?” I cried, myself under the impression the whole goofball enterprise had been shut down until PTSD groups could be mobilized to treat people for coulrophobia. “Sure!” I said. Who was I to turn down a noble cause? I was now in Corinne de Langavant’s world of pure magic, and it was time to get cracking. We were set to tape an episode of the “Coco and the Kids” series that my pal has got going on MVTV. We needed a theme, and we hatched one out of thin air (who knows where these ideas come from? ): We would conduct a political debate, running against one another for president of the Clown Club. I followed the long-haired, willowy woman around her house as she plunged into boxes and drawers and ransacked closets until both of us were layered up in in a haze of clown fantasia, she in striped pants, a long black frock coat with tails, red buffoon shoes, and a furry gray-blond hairpiece, me willingly making of myself a mannequin for a mauve-and-green wig topped by a flower-decked sunbonnet, a turquoise skirt, and a yellow-and-blue girly-girl smock. Corinne, as she excavated scarves and cravats and other wardrobe effluvia, held whispered conversations with the apparel; she’s fevered, you get to see a mad genius in action, in this case a mad clown in action, but don’t take that thought into the Scary Zone: Ms. De Langavant is the good, fun, gorgeously attired kind of clown. At last Corinne treated me to the full clown-face schmear: a huge red outline all around my lips, then blocked in with chalk-white paint, topped off with the classic red schnoz, glued to the nose with some kind of latex glue to keep it in place even after the sneeze that blew away Chicago. 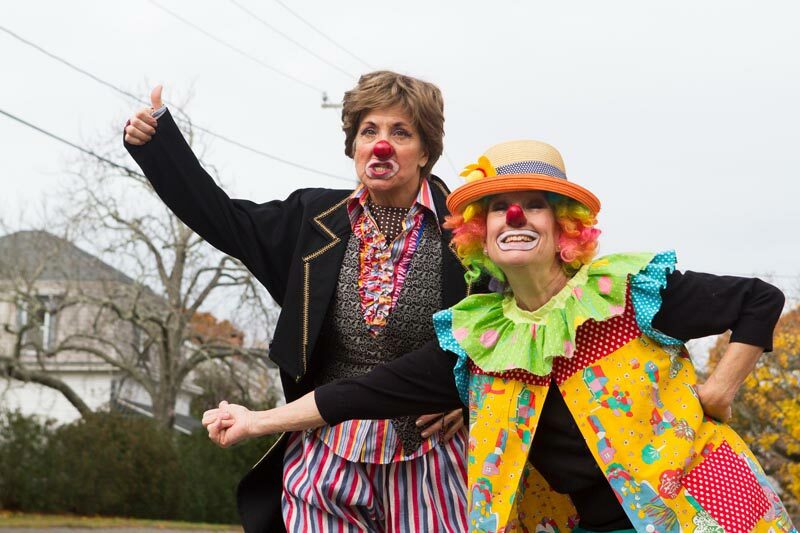 And then we headed off to the MVTV studio over near the high school, but not before I suggested angling for a ride curbside on New York Avenue, just to see if recent headlines about sociopathic clowns would get in the way of two cutie-pie clowns cadging a ride? And here are the results: A bunch of cars, trucks and dog-and-pony carriages whizzed by us in pointed refusal. Oh well, Coco has a car. At the studio, we conferred with production execs Michelle Vivian and Carl Holt and, bing! bang! bong! we struck poses on the stage, and pitched our election promises: Coco, in the person of Donny Frump, assured us everything would be gr-great, truly gr-great, we wouldn’t believe how gr-great, and I, Miss Clementine, clutching a teddy bear, and continuously dipping in a ballet first position plié (was this clown-y method acting? ), assured my supporters that I would help mommies and little kiddos. Who wouldn’t want to vote for me? Mr. Frump stalked behind me, and at one point gave my fanny a pat. “Is that an example of your stop and frisk policy?” I demanded to know. We did another routine, with Frump transgendering in a fetching skirt of layered pink-and-mauve patterns and a lavender wig. I put on a fun yellow-and-red fat suit that transformed me into Bertha, Obsessive Eater of Ice Cream. You can catch our act on the MVTV website: Search for “Coco and the Kids,” and then click on “political debate.” Believe me, you’ll know whom to vote for: Me! Me! Me! Me! Me! When we got back to Corinne’s Fun House, I was eager to pull off my scarlet nose and reams of clown over- and undergarments. With my teddy bear in my bike basket, I cycled down New York Avenue, then through the winding streets of the Campground, waving at everyone I knew, wondering why they looked askance at the sight of me. When I arrived home, I found out when I saw my reflection: I still wore my clown makeup! The big red-rimmed-and-white-primed clown mouth, plus two smears under my eyes, were still stamped on my face. Oh well. So I’d cycled around town with a clown face — was that a crime? (Well, I guess in Perth it is.) We’re all trying to cheer each other up, are we not, and what better way than with clown high jinks? After all, I was sweet Clementine — hardly Mr. cue-the-scream Pennywise! You can see Corinne’s and my shenanigans at mvtv.org/video-on-demand-castus/.